Maximum comfort comes with the Amish Metro Dining Chair. From the Keystone Collection that prides itself on handcrafting the best fine furniture, the Metro features creative cutouts for the chair back and supportive upholstery that will keep you enjoying your seat at the table long after dinner is over. With contemporary flair and top rate Amish construction, the Metro is a dining chair to share for generations. Enjoy a Lifetime Warranty on this Keystone chair that's built to go the distance. 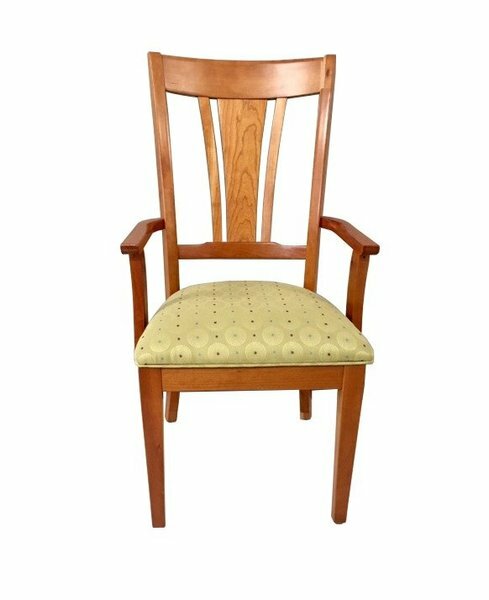 Keystone furniture always goes the extra mile, adding details like finished chair undersides, mortise and tenon construction and superior corner braces.Chairs like this feel different when you sit in them, with the rich quality construction making a big difference. With so many options available to you, we understand you may have questions. Our team of Amish Furniture Specialist is always happy to help. Get in touch via email or phone for personal service that goes the extra mile. Thank you for shopping with DutchCrafters.